Buddleia 'Evil Ways'. Bright gold foliage with striking purple flowers. The contrast is fantastic. Vegetatively reproduced, not an inferior seedling. 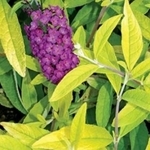 Like all butterfly bushes this newer variety thrives in well draining soil.